Why are workshops and lectures designed to meet your needs? Art Therapy is a diverse practice. Different Art Therapists work in different ways, using for example Sciences, Anthropology, Psychodynamic theories and practices to inform their work. Hospitals, Social Services, Charities, Schools, Hospices and more recently G.P Surgeries, Employment consultancy and Galleries etc. Physical conditions e.g. Cancer, Neurological disorders, Substance misuse, Dementia Care, Behavioral Difficulties, Mental Health Disorders as well as people who have a mild mental health difficulty, low confidence and self esteem. See 'What is Art Therapy' and section. 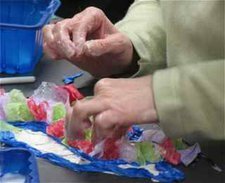 "One off Art Therapy Workshops"
Art Therapy workshops to help a group think about and reflect upon a specific subject, theme or event. E.g. Life Changes and losses or Transitions i.e. from one location, building or group to another. To facilitate thoughts and discussion about a theme common to the group that is difficult to verbalise. To help process a difficult situation and think about the way forward as a group. To help individuals to think about their skills and abilities, likes and dislikes. Employers, Employees, Clients or Patients, Community, Voluntary, Hobby, Support or Self Help Group and more! Your venue, community venue, Gallery, Museum or Archive. Also see Option examples. Reflective practice, working in museum and galleries, using art exhibits as a therapeutic tool, Arts on Referral / arts and wellbeing. Contact me for more details.